Home » Business » Apple Stock Raises by $50! 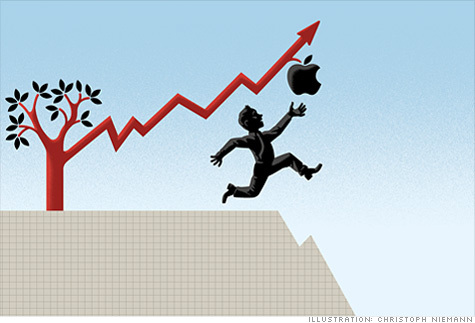 Apple stocks is in cloud 9 in Wall St. After Apple posted it’s profits that blew away everyone’s expectation. It was way higher than anyone could have ever imagined! Apple is now the most valuable company in the world! In fact, today Apple is the stock that propelled NASDAQ. A pple’s stock shot up more than $50 a share Wednesday after its quarterly profit blew away Wall Street expectations. The surge propelled the Nasdaq composite index to what would easily be its biggest gain of the year. Apple climbed more than 10 percent in early trading, enough to make back most of what it lost during a two-week slump before the earnings announcement late Tuesday. The company turned a profit of $11.6 billion from January through March, or $12.30 per share. That is almost double what it made in the same quarter a year earlier and far above the $10.07 that Wall Street was expecting. Apple sold 35 million iPhones during the first quarter. One possible reason for the two-week slump was an analyst’s suggestion that Apple could not keep up the momentum in its iPhone sales. Stock in Apple, the most valuable public company in the world, hit $644 in intraday trading on April 10. It slid as low as $579 a share a week later. On Wednesday, it was up $54 to $614.53. The gain in Apple stock helped power the Nasdaq to a gain of 67 points, to 3,029, just after 10 a.m. EDT. Apple makes up 12 percent of the Nasdaq, by far the biggest component. It will be all night party at Apple! $250,000 Subway Typo - 80,000 Maps with Wrong Fares! Next: Mad Cow Disease is Back, Outbreak in California!